When updating Exchange (either to a whole new release, or most times even for a Service Pack) you have to prepare your AD first. 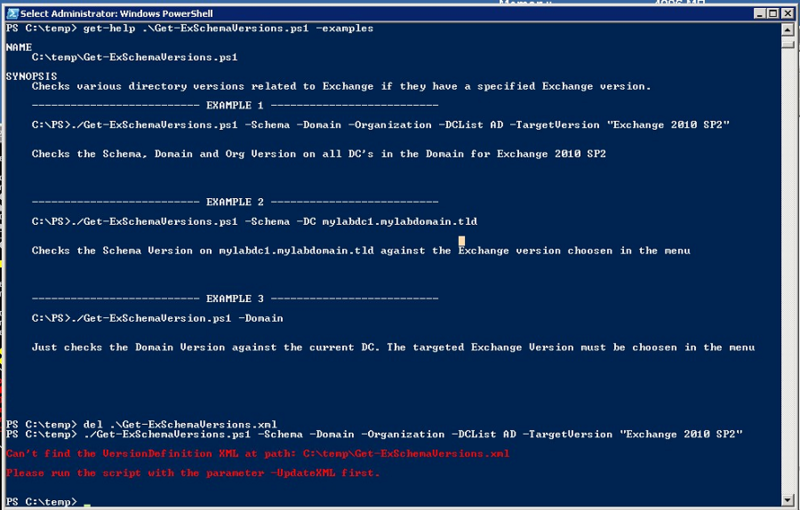 Especially in an environment with multiple domain controllers you should perform a Schema Upgrade before running the actual setup of Exchange. Before continuing with the Setup it’s recommended to check if all your DC’s are already replicated and already have the updated Schema. Well, this could be a tough job, especially if you have lots of DC’s. Time ago I created the following script to support me with this task. Now I thought it’s time for a redesign and I wrote it almost from scratch. Actually it’s quite simple. It connects to your DC’s and reads the different directory versions (Schema, Org and Domain) and compares it to the version you specify. In case everything is good the output will be green, otherwise yellow. There are several options, e.g. you can specify a single DC, a list of DC’s based on a text file or simply let the script get a list of DC’s from AD. Querying all versions from all DC’s in my Lab Environment. Hope you find the script useful. Please let me know your concerns, wishes, complains in the comments or via Mail.